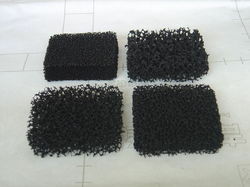 Pioneers in the industry, we offer reticulated foam from India. This Foam has 100% open cells made by thermal reticulation process.The Foam blocks are placed inside high reticulation chamber for charging with gas to convert it in different PPI(pores per linear inch)depending upon the customer needs. MAJOR APPLICATIONS 1. Filtration and Pre Filtration Of Air,Oil and Water 2. Ceramic Foam Filter. 3. Outdoor Furniture. 4. Microphones and Headphones 5. Safety Fuel Tanks 6. Ink Cartridges We have different ppi & density grade. ColorsBlack(Standard),Blue,yellow,green Sheet Size 1000 mm to 2000mm Thickness 10mm ,15mm,20mm, Customized Die Cut Also.